Who would ever have imagined that the reappearance of a 17-year-old movie would become the fourth-biggest September box office hit of all time? But that is what has happened as Disney’s 3D version of The Lion King opened with $30.2 million, behind only 2002’s Sweet Home Alabama , ($35.6 million), 1998’s Rush Hour , ($33.0 million), and 2009’s Cloudy with a Chance of Meatballs ($30.3 million). Disney executives may now be kicking themselves for their decision to bring the movie back to theaters for only two weeks before releasing it on Blu-ray disc on October 4. There does not appear to be even any wiggle room between the theatrical and home video releases. Among the new films, the critically praised Drive fared the best, but its $11.3 million was hardly worthy of cheers. It wound up in third place (behind the second week of Contagion , which slipped to second place with $14.6 million). Still, it was better than Straw Dogs, which opened in fifth place with just $5.1 million. And I Don’t Know How She Does It didn’t do much at all, as it tanked with $4.4 million. World-renowned singer, songwriter and performer, Elton John will return to The Colosseum at Caesars Palace with an all new show, “The Million Dollar Piano,” beginning September 28 for sixteen shows. Elton’s September return will mark the beginning of a three-year residency at The Colosseum and his second as a Caesars Palace headliner. Limited VIP tickets are available through the Caesars Palace Box Office. Tickets may be purchased in person at The Colosseum at Caesars Palace Box Office, open daily from 10 a.m. to 10 p.m. PDT, as well as online at TicketMaster.com, keyword “Elton John.” For groups of 20 or more, call 702.731.7208. Elton completed a highly successful five-year residency at Caesars Palace in April of 2009 with the critically acclaimed “The Red Piano.” Originally booked for 75 shows over the course of a three-year run, audience demand for “The Red Piano” was so overwhelming the engagement was extended for a total of 241 shows over a five-year period. Elton will be accompanied by his band, which includes Davey Johnstone on guitar, Bob Birch on bass, John Mahon on percussion, Nigel Olsson on drums and Kim Bullard on keyboards with a special appearance by percussionist Ray Cooper. One of the most successful live acts on the road today, Elton and his band put on an unforgettable show: the entire audience standing, dancing and singing along with much-loved classic songs. The monumental career of international singer, songwriter and performer Elton John has spanned more than five decades. He is one of the top-selling solo artists of all time, with 35 gold and 25 platinum albums, 29 consecutive Top 40 hits and has sold more than 250-million records worldwide. 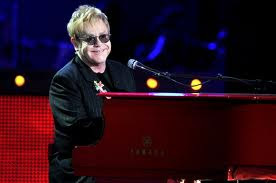 Elton holds the record for the biggest selling single of all time, “Candle in the Wind,” which sold 37-million copies. Since his career began in 1969, he has played almost 3,000 concerts worldwide. The National Academy of Recording Arts and Sciences has awarded Elton five Grammys, the Grammy Legend Award and honored him with the Music Cares Person of the Year Award. Elton was inducted into the Rock & Roll Hall of Fame in 1999. Elton’s new album with Leon Russell, The Union, produced by T Bone Burnett, was released last fall. In April 2011, the Tribeca Film Festival will open with the world premiere of Cameron Crowe’s documentary, The Union, which captures the writing and recording of the John and Russell album. The smash-hit stage production of Billy Elliot, for which Elton composed the music, originally opened in London and garnered Elton a top-five hit in the UK with the song “Electricity.” Billy Elliot was nominated for a record nine Olivier Awards, winning Best Musical among others. Billy Elliot opened on Broadway November 13, 2008 to critical acclaim. It was nominated for a record-tying 15 Tony Awards and won 10 including Best Musical. In March of this year, Billy Elliotopened in Toronto to rave reviews. Elton received an Academy Award for The Lion King and Tony awards for bothThe Lion King and Aida. He served as the executive producer for the hugely successful animated feature Gnomeo & Juliet, which opened in February 2011. In 1998, the Queen of England knighted him Sir Elton John, CBE. In 2004, Elton received the Kennedy Center Honor for his lifetime contributions to American culture and excellence through the performing arts. For additional show and ticket information, visit CaesarsPalace.com or follow updates from Caesars Palace on The Colosseum on Twitter.